This husband and wife team worked the circus and carnival circuit during the 1920s and 1930s. Today, we can say that the Hamiltons are well known partly because of the tattooing that Percy Waters did on Mrs. Ted Hamilton (as she was often billed). Sometimes she was also known as Smittie. Thanks to ongoing research by Carmen Nyssen, we now know that Ted was married at least four times. The woman we thought was Pearl Hamilton in all those Kobel photographs is actually Myrtle Hamilton. 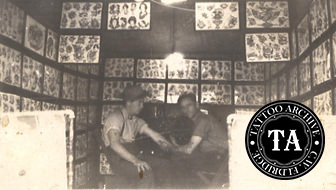 Myrtle and her tattooing can be seen in Kobel photographs No. 452, 495, 523, 549, 688 and 921. Myrtle had perhaps the world’s largest peacock back piece. Most of her pitch cards show her in a backless dress that maximized the effect of the tattooing. The husband and wife team worked the sideshows together, with Myrtle on the sideshow stage with the other attractions and Ted on the midway with a portable tattoo set-up. Ted, a right-handed tattooist, is said to have worked with Milton Zeis on flash ideas for The Zeis Studio. Photographs in the Archive’s collection show Ted in a shop setting working out of a wardrobe style tattoo trunk with wooden folding chairs and walls covered with flash sheets. While working in circuses and carnivals Ted would set up in small canvas tents with his flash hanging from the support rods of the tent. On the road Ted worked out of a small case at the back of the tent. He worked on a platform, which kept Ted and his gear up out of the muck and was just large enough for two chairs and his tattoo case. His case was simple but complete, and involved little time to set up and break down. When the Hamiltons were not on the road they could be found at #503 Sixth Street in Peoria, Illinois.